Luckily, I think I can piece together the recipe using this photo as my most critical (and only) trace of remaining evidence that I ever made this relish at all. Except that I recall how good it was on top of a really juicy pork chop. OH PLEASE, hold your applause till the end. Really! 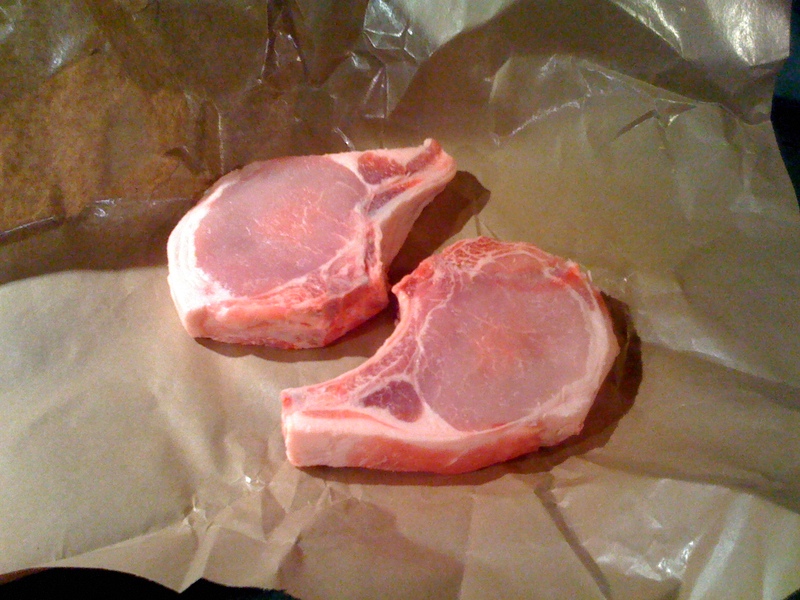 Another thing I remember (only because I’m looking at a Cook’s Illustrated recipe as I type this), is that I cooked the pork chops differently than I usually do, and they came out exceptionally tender and moist, which is something that has always eluded me with pork chops and is why I rarely make them. Well, no more I say! Okay, back to the relish. I’ve pieced together what I remember below. So, just be creative, try my formula, and add something if you think it needs it. How’s that for vague? Adjust oven rack to middle position and heat oven to 275 degrees. Pat chops dry with paper towels. Using sharp knife, cut 2 slits, about 2 inches apart, through outer layer of fat and silver skin. Sprinkle entire surface of each chop with 1 teaspoon salt. Place chops on wire rack set in rimmed baking sheet and let stand at room temperature 45 minutes. Season chops liberally with pepper; transfer baking sheet to oven. Cook until instant-read thermometer inserted into centers of chops and away from bones registers 120-125 degrees, 30-45 minutes. Heat 1 Tablespoon oil in 12-inch heavy-bottomed skillet over high heat until smoking. 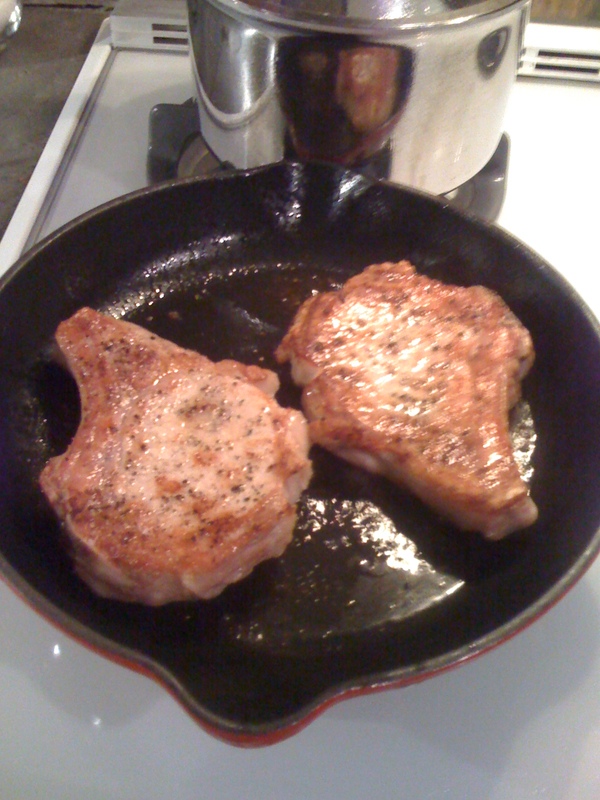 Place 2 chops in skillet and sear until well browned and crusty, 1 1/2 to 3 minutes, lifting once halfway through to redistrubute fat underneath each chop. (Reduce heat if browned bits in pan bottom start to burn.) Using tongs, turn chops and cook until well browned on second side, 2 to 3 minutes. Transfer chops to plate and repeat with remaining 2 chops, adding extra Tablespoon oil if necessary. Reduce heat to medium. Use tongs to stand 2 pork chops on their sides. holding chops together with tongs, return to skillet and sear sides of chops (with exception of bone side) until browned and instant-read thermometer inserted into center of chop and away from bone registers 140 to 145 degrees, about 1 1/2 minutes. Repeat with remainig 2 chops. Let chops rest, loosely tented with foil, for 10 minutes while preparing sauce. Sautee onion in olive oil until soft and translucent. 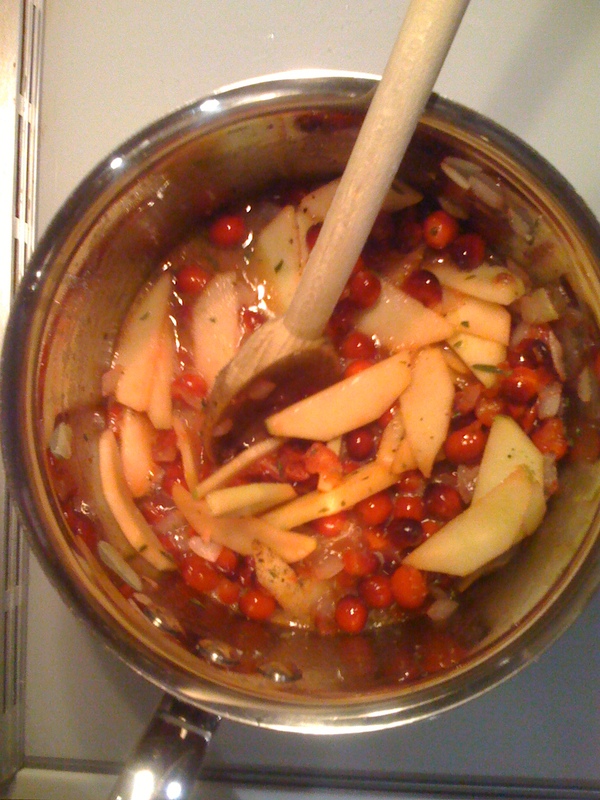 Add cranberries and garlic; sautee until garlic is fragrant (about 30 seconds). Add sugar (maybe a 1/4 cup?) let the cranberries simmer and “pop” for about 5 minutes. Added granny smith apple and about 1/2 a tablespoon of rosemary and let cook for about 5 more minutes, or until apple is soft; season with salt and pepper to taste. Remove from heat at add about a Tablespoon of butter. 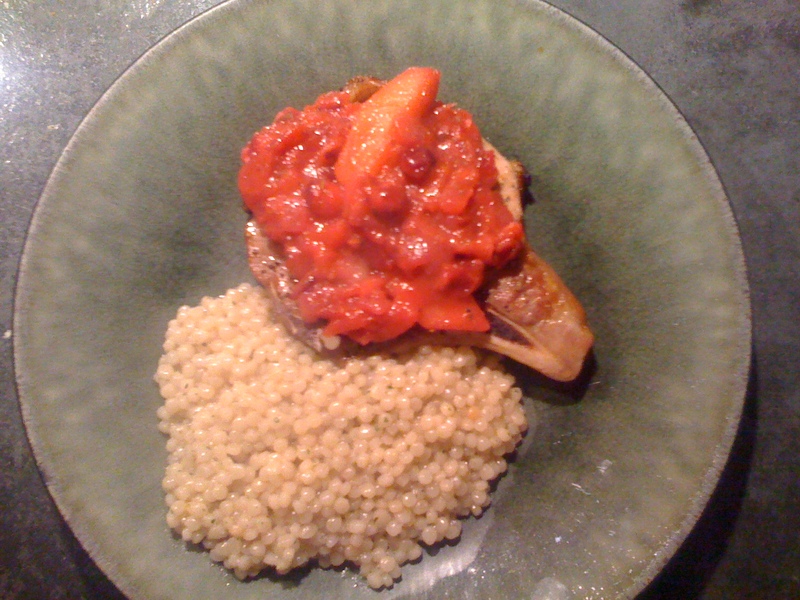 I served this with some garlic/herb pearl (or Israeli) cous cous, which I highly recommend. I’m not certain whose fault the modern scone is. Should we blame the British for inventing this dry lump of heavy, overly sweet, doughy ickiness? Or did Americans take what once was a delicious sweet biscuit and turn it into a sugary hockey puck? Whoever’s at fault, this recipe will forever change your notions about scones. These scones are flaky, buttery, and not at all heavy. This recipe, which is from Cooks Illustrated, is so wonderful, I will wake up on a weekend morning and spend the first hour of it making these. Glenn and I, who are absolutely ravenous by the time they are ready, are perfectly willing to wait for them. They are that good. This recipe calls for grating the butter and then mixing it into the dry ingredients. I know, it seems like overkill, but please trust me. The butter is so perfectly distributed this way, and it ends up leaving little pockets of buttery goodness throughout the scone, which is just, well, hard to describe in words. …and fold the edges in like this (using a pastry scraper makes this task a ton easier) . 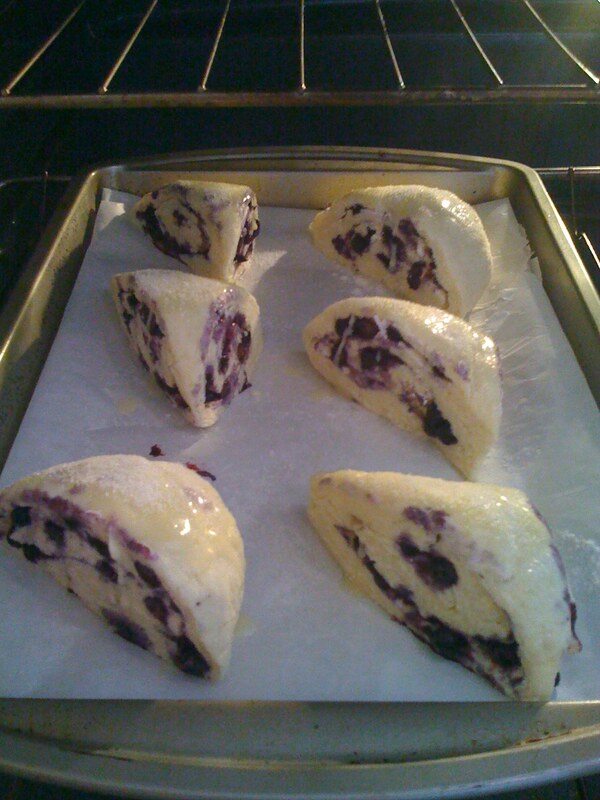 After letting it sit in the freezer for five minutes (allowing the dough to firm so it is easier to work with), roll it out once more, add the blueberries on top, and then roll it up like a sleeping bag. Awww, it’s cute. Then, cut the log (log?) into four parts and cut those four parts diagonally. Put them on a parchment-lined baking sheet, brush some butter (yes, more butter) on top, and sprinkle (generously) with sugar. If you don’t want to wait that long (or if you’d like to spend your Sunday morning doing something else), just mix together the dry ingredients the night before. It goes much faster that way. And yes, I know blueberries aren’t in season right now, but I cannot go a whole year waiting for blueberries to come back–and I happened to have some frozen from the summer. Yay me! Tell your family to relax, have another cup of coffee, blame the British for their bad scones, and hang on for a little while. These are worth it. Adjust oven rack to middle position and heat oven to 425 degrees. Grate one stick of butter using the large holes of a box grater (the faster you can do this, the less messy it will be). Put the bowl o’ grated butter in the freezer. Whisk together milk and yogurt in medium bowl; refrigerate until needed. Whisk flour, 1/2 cup sugar, baking powder, baking soda, and salt in medium bowl. Add frozen butter to mixture and toss with fingers until thoroughly coated. Add milk mixture to flour mixture; fold with spatula until just combined. With rubber spatula, transfer dough to liberally floured work surface. 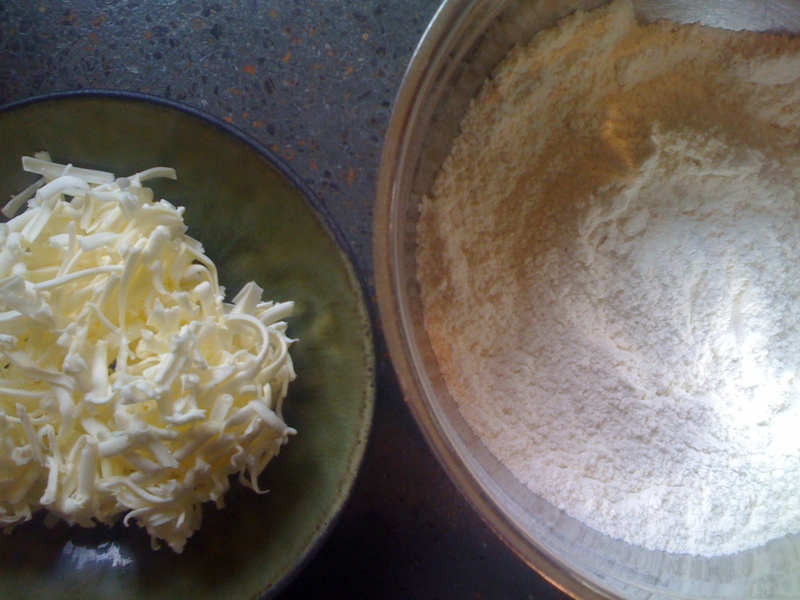 Dust surface of dough with flour; with floured hands, knead dough 6-8 times, until in just holds together in ragged ball, adding flour as needed to prevent sticking. 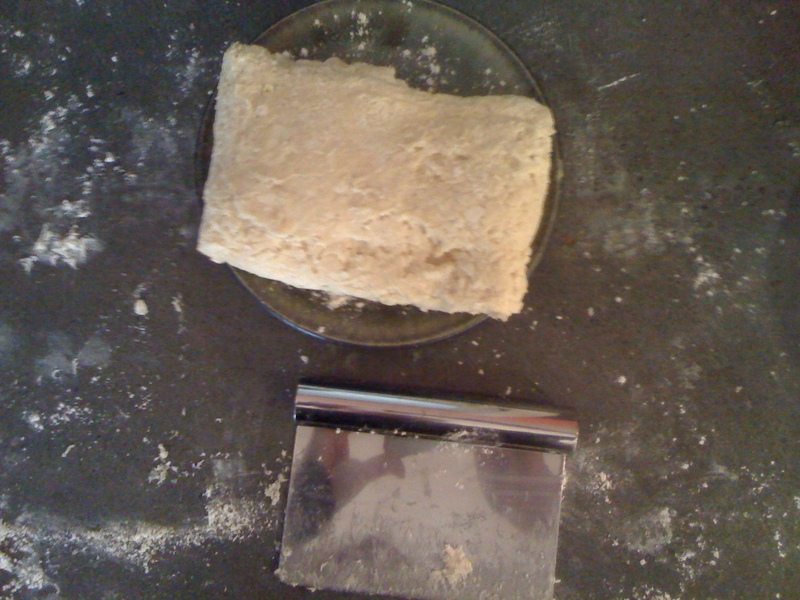 Roll dough into approximate 12-inch square. Fold dough into thirds like a business letter, using bench scraper or metal spatula to release dough if it sticks to countertop. 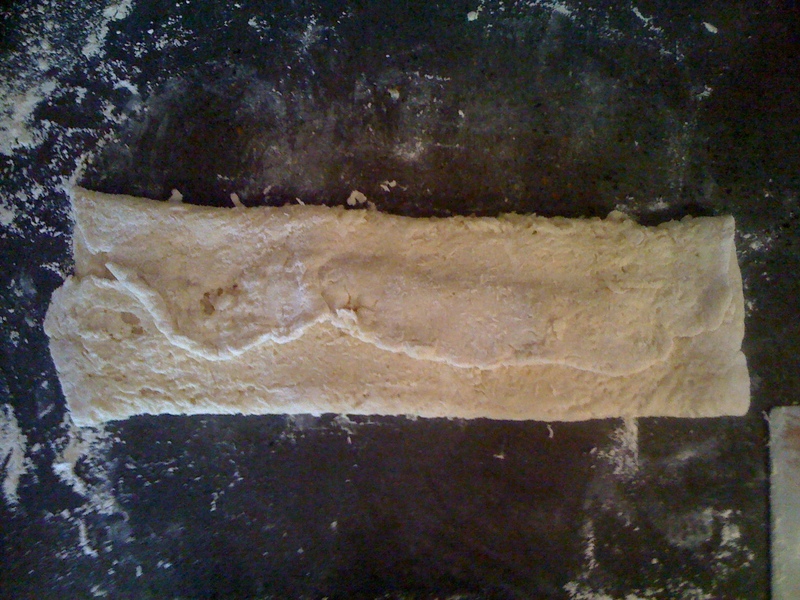 Lift short ends of dough and fold into thirds again to form approximate 4-inch square. Transfer dough to plate lightly dusted with flour and chill in freezer for 5 minutes. 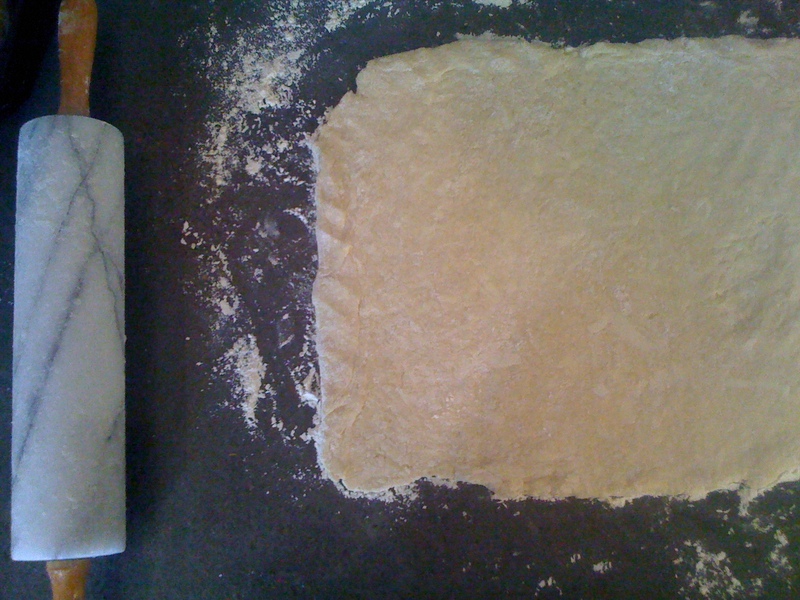 Transfer dough to floured work surface and roll into approximate 12-inch square again. 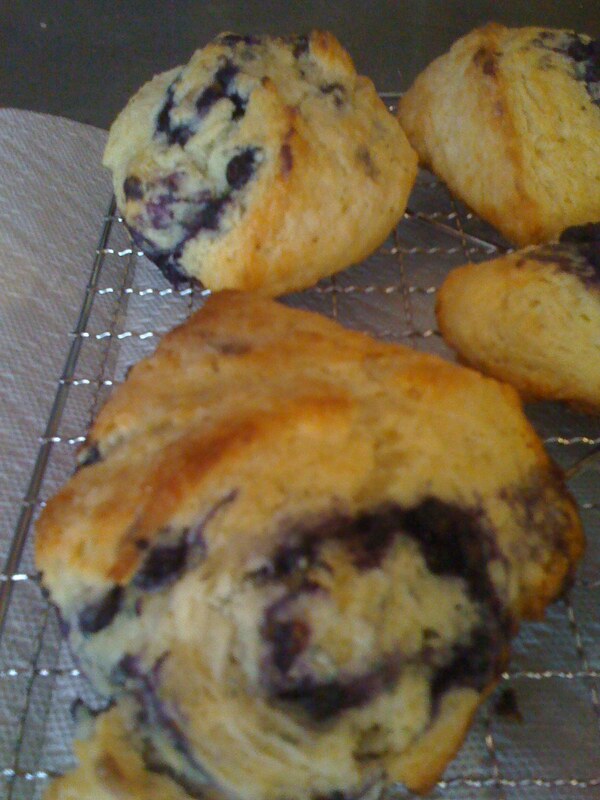 Sprinkle blueberries evenly over surface of dough, then press down so they are slighly embedded in dough. Using bench scraper or thin metal spatula, loosen dough from work surface. 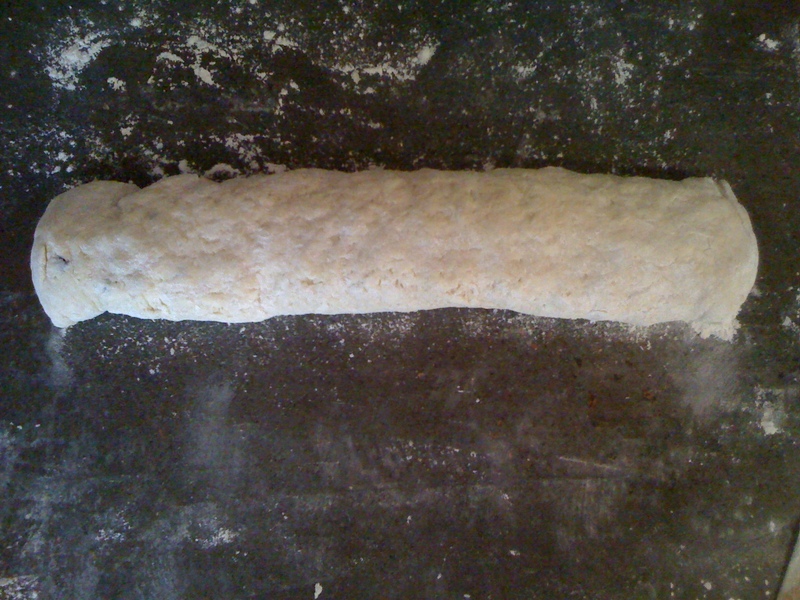 Roll dough, pressing to form tight log. Lay seam-side down and press log into 4 equal rectangles. Cut each rectangle diagonally to form 2 triangles and transfer to parchment-lined baking sheet. Brush tops with the remaining butter (melted) and sprinkle with remaining sugar. Bake until tops and bottoms are golden brown, 18-25 minutes. Transfer to wire rack and let cool 10 minutes before serving (or until you can’t wait any longer, which is usually about 30 seconds for me). Let’s say–hypothetically–that you ate too much over the Thanksgiving holiday. 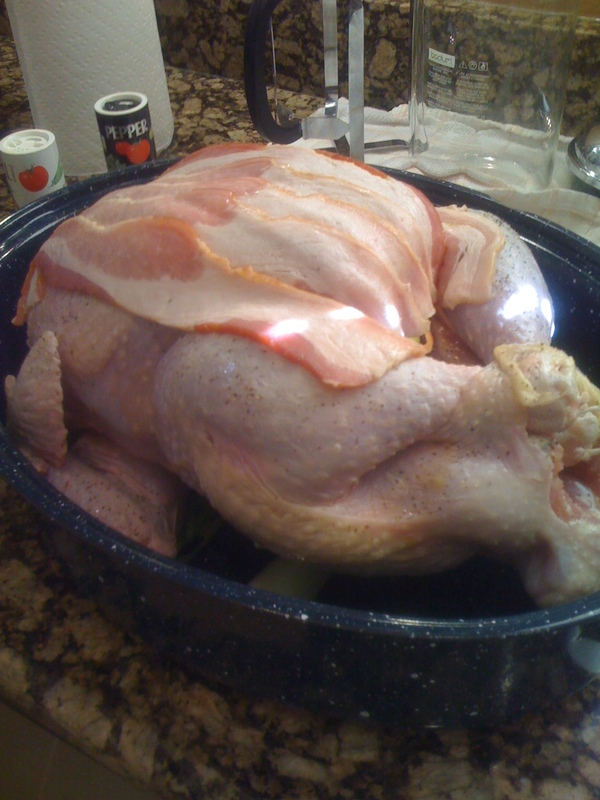 Perhaps you went a little nuts and did something that I’m pretty sure it says somewhere in Leviticus that you’re not supposed to do: you wrapped your poor ol’ turkey in bacon. As if the candied sweet potatoes, pumpkin pie, and 17 glasses of wine weren’t enough, you had to go and add pork fat. 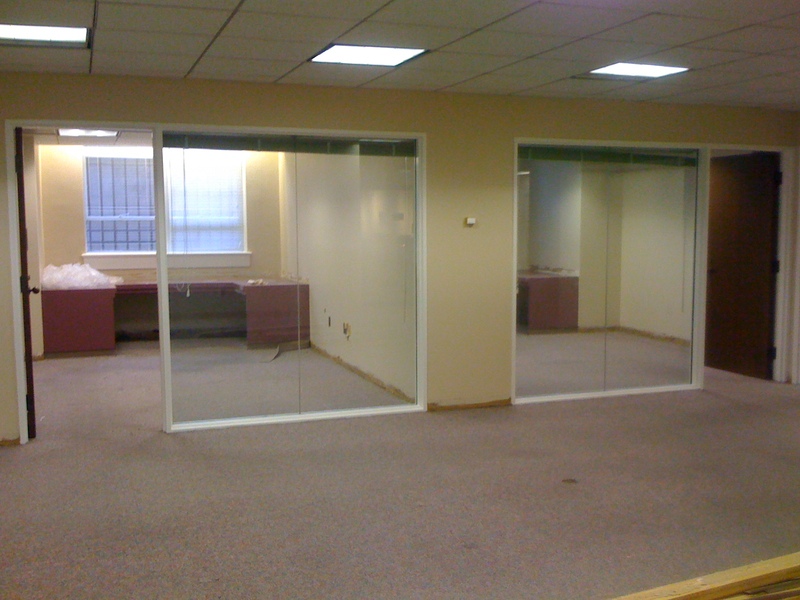 And let’s just say–hypothetically again of course–that when you returned to the office after your gluttonous Thanksgiving holiday (during which you unrepentingly consumed one whole bacon-wrapped turkey), you discovered said office to be completely devoid of office furniture, computers, telephones, or even filing cabinets. Assuming all of these things happened–and I’m not saying they did or they didn’t–you might want to have something light and easy-to-cook tonight for dinner. My vote is for a warm mushroom salad, courtesy of one Ina Garten, who has never to my knowledge ever put out a bad recipe. If you made an Ina recipe and it turned out bad, I’m gonna go out on a limb and say it was probably your fault. The great thing about this recipe is, though it is a salad, it’s great for wintertime. The mushrooms and the mushroom “broth” with sherry or red wine vinegar make this salad seem like anything but. Plus, the proscuitto makes that person in your family who *must* have meat at every meal (you know who you are) happy and delighted that when you said you were going to make a salad for dinner (audible groan) they were pleasantly surprised when you put this on the table! Though Ina calls for sundried tomatoes in this recipe (and I usually do use them when I make it), I could not find them anywhere in my newly-reorganized Publix grocery store (why must everything change when you go on Thanksgiving holiday!?). I thought the peppers were excellent and fully interchangeable with the tomatoes. The only difference is that I cooked them with the mushrooms to heat them up a bit. 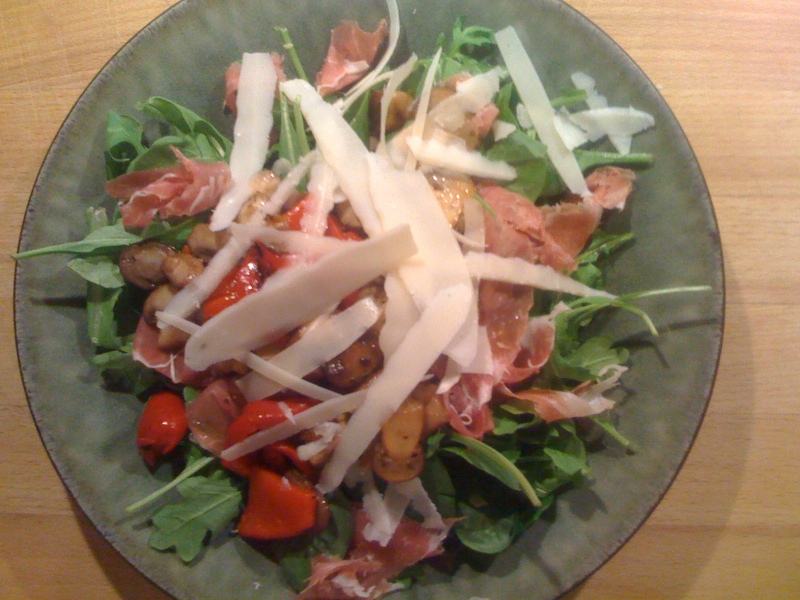 Also, Ina tells you to “cover each portion” of the arugula with proscuitto slices. Well, I just don’t feel like sitting down to a salad and having to cut my way through it…so I shred the meat with my fingers first. Lazy? No, I prefer industrious. There you have it: the answer to a holiday meal gone over the top and an unusable office. Clean the mushrooms by brushing tops with a clean sponge. Remove and discard the stems and slice the caps 1/4 to 1/2 inch thick. In a large saute pan, heat the butter and 2 Tablespoons of the olive oil until bubbly. 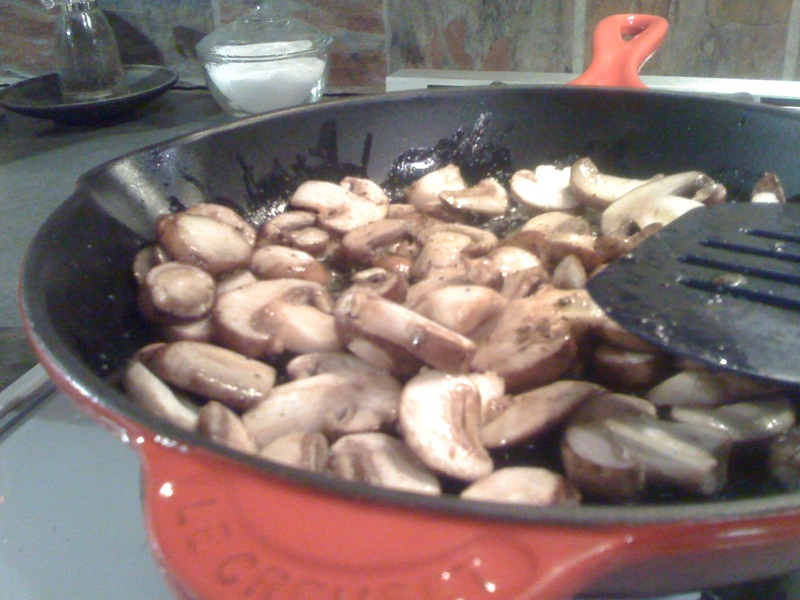 Add the mushrooms, salt, and pepper to the pan, and saute for 3 minutes over medium heat, tossing frequently. Reduce the heat to low and saute for another 2 to 3 minutes, until cooked through. During the last 2 minutes of cooking, add the peppers. 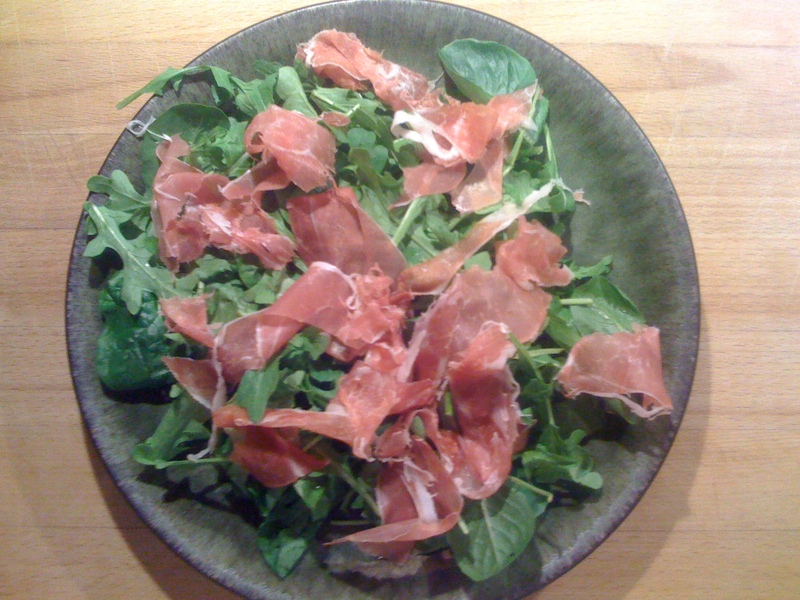 Meanwhile, arrange the arugula on 2 plates and cover each with proscuitto (shred with fingers into bite-sized pieces). 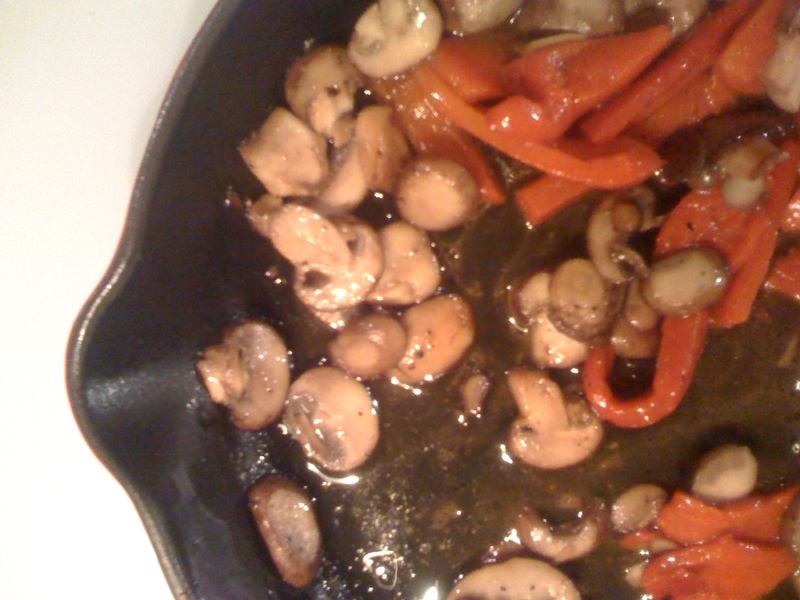 When the mushrooms and peppers are cooked, add the sherry/red wine vinegar and the remaining 2 Tablespoons of olive oil to the hot pan. 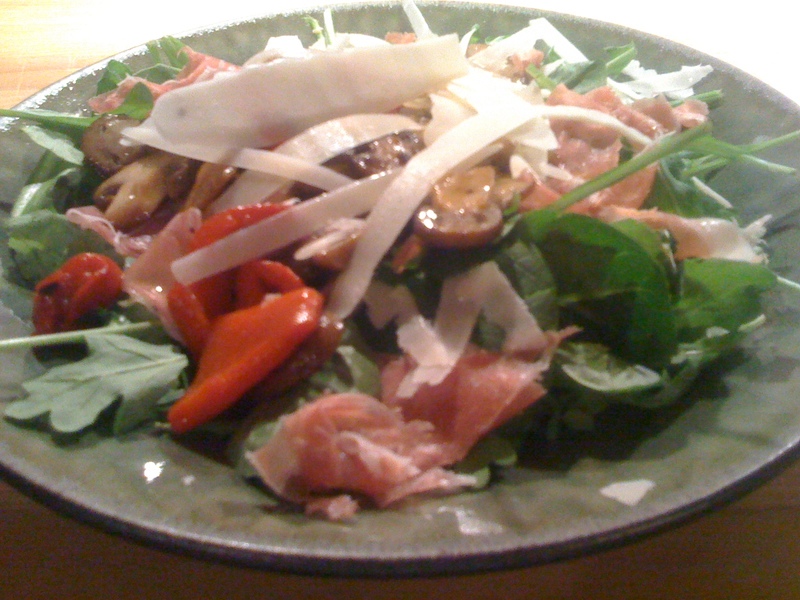 Spoon the mushrooms and sauce on top of the proscuitto. With a vegetable peeler, make large shavings of Parmesean cheese and place on top of the hot mushrooms. A friend of mine told me she made apple streusel muffins and won a prize at her local fair. She posted a photograph on Facebook of a beautiful plump muffin covered with sweet streusel topping next to a blue ribbon. I kept thinking about that muffin. Oh yes, it entered my consciousness and made me think of nothing else. I dreamt that the muffin and I ran off together and got married. I kept thinking I’d get the recipe from her, but I never got a chance to ask her was too lazy. Then, one morning, I woke up and HAD TO HAVE THEM. I had apples, I had flour, I had sugar and butter, but I did not have the recipe. Desperate, I looked up any ol’ apple streusel muffin recipe I could find–and came up with an Emeril Lagasse recipe from the Food Network. I made it. It was fine. It was nothing special really. It wasn’t a recipe I’d take home to meet my mom. Then, this morning I woke up again–apples in the fridge–and had a major, bigtime craving for these babies. Now, I had the recipe, but did not have the correct ingredients. At 7:00 in the morning, I wasn’t about to go to the grocery store. So, deciding I didn’t want to use the Emeril recipe again, I morphed several recipes into a new creation, and here’s what I came up with. Now, this may not win me a blue ribbon at the local fair, but it was quite lovely for a fall Saturday morning and, yes, I would take it home to my mom (cause she’d scarf it down just like me!). I used gala apples, which are very sweet and stand up well this recipe. Also, I added some shredded coconut. I have gotten into a habit of adding coconut to a lot of my muffin recipes. I don’t know why, but I really love the extra texture and sweetness. And I guess I’m just out of my mind cRaZY and will apparently do just about anything! Also, a lot of recipes say to shred the apple. But why? Why would you do that? It makes no sense to me why you wouldn’t want some nice apple chunks in there. I mean, they can’t be too large so that the muffin wouldn’t hold together, but a small, even dice should do. Do not settle for an inferior muffin when you can wait for the muffin of your dreams! So, here you have it. It is my soul muffin, and it may be yours as well. Heat oven to 400 degrees. Grease 12 medium muffin cups. Whisk milk, oil, vanilla and egg in large bowl. Stir in flour, sugar, baking powder, nutmeg, cinnamon, and salt all at once just until flour is moistened (batter will be lumpy). Fold in apples and coconut. Divide batter evenly among muffin cups. Sprinkle each with about 2 Tablespoons of topping. Bake 20 to 25 minutes or until golden brown. Immediately remove from pan to wire rack. Cut butter into flour, brown sugar and cinnamon using pastry blender or crisscrossing two knives until crumbly. Way at the top of the list of beef stew sins are: a) taking your stew out of the oven too early thereby ending up with beef that is tough and hard to chew, and b) making a broth that is too watery. This stew takes those two sins and whips them in the arse. How does it do that? Well, first of all, it has a 1/2 bottle of wine in it. The wine gives the broth a wonderfully deep, rich taste and–though I haven’t conducted any sceintific experiments–I think the acidity of the wine helps to break down the beef fibers to make it oh-so-tender. I adapted this recipe from Jamie Oliver, who says that he tried to make this stew like any other beef stew or boeuf bourguignon recipe, where you first brown the meat, then add the vegetables. But, he said this particular stew came out better without browning the meat at all and just adding the vegetables at the same time. That’s great news for us, because it’s that much easier to make! While Jamie’s recipe called for parsnips and Jerusalem artichokes, I used what I had from the farm–turnips instead of parsnips–and I nixed the Jerusalem artichokes because they are just so freakin’ expensive. One note: I do not peel my root vegetables. I just don’t think it’s necessary when you’re using organically-grown veggies. Besides, how many people have eaten potato skins before? The skin of the carrot or the turnip is the same thing, right? Just wash ’em up real good! Besides, I don’t think a little dirt will hurt you. It’s called terroir–when the food takes on the flavor of the place it was grown. Yeah, this generally refers to wine…but I think it could be true with carrots too. Remember, you’re going to be adding a 1/2 bottle of wine to this. I admit, it is hard for me to pour a 1/2 bottle of wine into the pot, thinking about putting it to better use (by actually drinking it), but it is well worth it. I usually choose a wine that I would normally drink anyway (do NOT buy a bottle that you wouldn’t normally drink…it will taste in the stew like it tastes in the glass, so you’ll want to buy something you like. And don’t–under any circumstances–buy cooking wine. It will taste terrible). I really like this line of wines called “Just.” You can find them at Whole Foods and they are under $10.00. They are great for cooking with or for your regular weekday wine intake, when you don’t need anything too fancy, but you also don’t want to drink something icky. Half goes in the stew, and half goes in my tummy while I cook! It’s already a party and I haven’t even eaten anything yet! This stew cooks for a while in the oven (3-4 hours). Don’t take it out a moment sooner than that! You want the beef to be nice and tender and to fall apart under your fork. By all means, test it first. I will tell you, the smell of this stew in your kitchen (and throughout your house) is a wonderful, comforting, warm smell, and it is totally worth the wait. When you take the stew out of the oven, just before serving, add the garlic/rosemary/lemon mixture. It is so fragrant and adds a phenomenal touch to the stew. Don’t skip it! By the way, I made some cornbread to go with this, and it made for great dipping. As you can see by the picture below, my dog Jack was all-too-happy with this recipe. I shared a little with him, but saved most of it for leftovers. It made for a great weeknight dinner the second time around. Preheat the oven to 300ºF. Put a Tablespoon of oil and a Tablespoon of butter into an oven-safe dutch oven. Add the onion and all the sage leaves and fry for 3 or 4 minutes. Toss the meat in a little seasoned flour, then add it to the pan with all the vegetables, the tomato purée, wine and stock, and gently stir together. 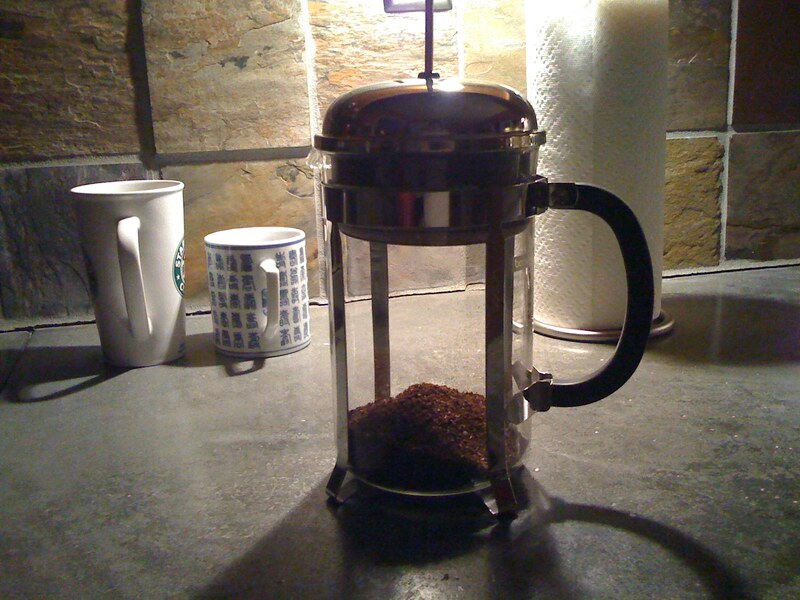 Season generously with freshly ground black pepper and just a little salt. Bring to a boil, place a lid on top, then cook in the preheated oven until the meat is tender. Sometimes this takes 3 hours, sometimes 4 – it depends on what cut of meat you’re using and how fresh it is. The only way to test is to mash up a piece of meat and if it falls apart easily it’s ready. Once it’s cooked, you can turn the oven down to about 225°F and just hold it there until you’re ready to eat. 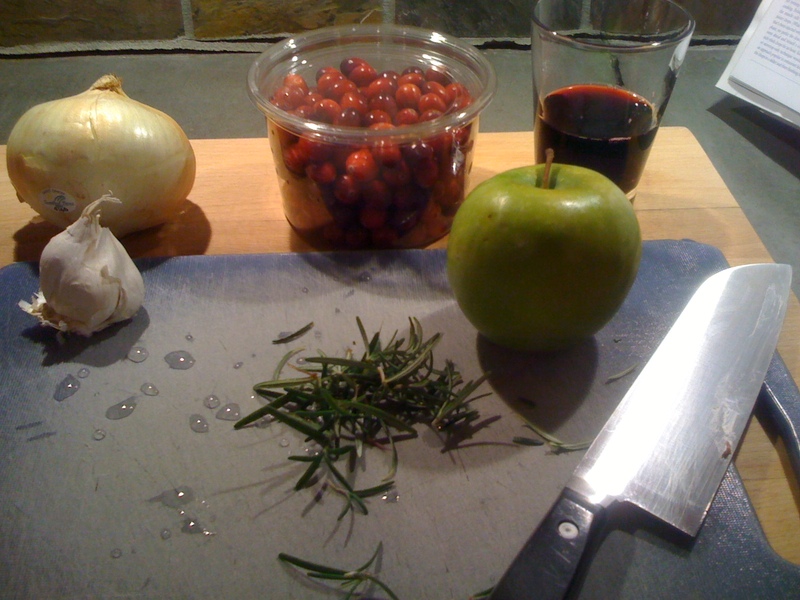 Mix the lemon zest, chopped rosemary and garlic together and sprinkle over the stew before eating. Just the smallest amount will make a world of difference. *I do not peel my root vegetables. I use organic vegetables, so there are no pesticides to worry about. I make sure I clean the dirt off as well as I can. Other than that, a little clean dirt will never hurt anyone. I would argue it adds a little local flavor (er, maybe). When I make dishes that are really good and really easy, I wish I could go back in time and tell my 25-year-old self that there’s no need to overdo it. I’m specifically referring to the time I invited my family over to my Baltimore loft for Christmas dinner and went perfectly mad when I tried to cook about 8 dishes for my little dinner party of 5. It was a rookie mistake, and I learned my lesson that night with a little help from my husband, who rescued me despite the fact that I had been cooking all Christmas day and had barely spoken to him. It was a bad scene folks. I think I got every single recipe for that dinner from Martha Stewart (whose recipes I generally like, but they can be just a tad complicated). And I didn’t begin cooking until that morning. I think I made three different kinds of cookies (sugar, gingerbread, and peanut butter blossom), several ridiculously intricate side dishes that included things like homemade breaded and fried onions (because what would Martha say if you didn’t make your own!? ), and sweet potato casserole, which I had never made before (I don’t think I had ever roasted a sweet potato in my life). Five minutes before my family was to arrive, and realizing my dining room did NOT look like the cover of Martha Stewart Living, I completely lost it. Unlike that hot mess, this is a perfect weeknight meal. It’s quick, it’s easy, and there’s not much to clean up. The butternut squash, with the addition of the cream, becomes tender and, well, creamy. The seasonings on the chicken are light and tasty, and leaving the skin on means the chicken comes out moist. And the best part is that your partner will not have to rescue you. Put chicken breasts in a bowl. Deseed and slice chilies and add them to the bowl with a few sprigs of chopped, fresh sage. Sprinkle with sea salt and freshly ground black pepper. Toss together and set aside. Carefully slice a medium butternut squash into quarters. Remove the seeds and slice 2 quarters of the squash as thinly as possible (I didn’t use all of the second quarter. Just use what will fit in your baking dish). Place each chicken breast and flavorings snugly in an aluminum foil “bowl” sitting in a medium baking dish. Place the squash slices around the chicken breasts snugly. Pour the cream around the squash slices (not on the chicken). Season with grated nutmeg, sea salt, and pepper. Drizzle with a little olive oil and bake in the center of the oven for 35-40minutes. Dead southwesterners everywhere are rolling over in their graves because Paula Deen has added collard greens to their chili. Yes, I’ve done it again, I’ve gone to Paula Deen for another recipe. And you know what? It is the best white bean chili I have ever had. EVER. This is a very bold statment for me to make, especially since I don’t love collard greens as much as other greens. I’m not a huge fan of the traditional preparation of collard greens–which is to cook them to death with some ham hock. But this…THIS…I could eat once a week. It was absolutely delicious. And I think it could easily be made vegetarian–just add some more beans, take away the chicken, and replace the chicken stock with vegetable stock. And would you believe this Paula Deen recipe does not have even a teaspoon of butter? No, y’all, it does not. It has been chilly and rainy in Birmingham for the past, hmmmm…month? This soup was perfect for a chilly, rainy night, and I’m actually going to make it again as soon as Glenn brings home more collards. I decided to alter Paula’s recipe just a smidge and, instead of chopping the chicken up beforehand, I let it simmer longer in the broth whole and allowed it to break up itself. I’m sure if you don’t have time to spare, you could chop it up first. But letting it simmer for a whole hour really does make the chicken super tender and allows the flavors to marry longer. Aw, I love it when flavors marry, don’t you? It’s sweet. Another thing to mention about this dish: an acquaintance of Glenn’s brought us some fresh New Mexico green chilies she picked up while she was out there visiting (these are the benefits of being a farmer–people trade you great stuff for your produce). Though Glenn and I use green chilies in a lot of cooking (and we must, of course, use the canned variety), the flavor of fresh chilies is superior (the canned variety can taste slightly “tinny”), and the ones we used for this recipe were very very hot. Though I didn’t have any time to make cornbread with this, I highly recommend doing so. I would have loved to dip some cornbread in this chili to sop it up and take off some of the heat. If you don’t like your chili too hot, just don’t add as many crushed red pepper flakes and use mild green chilies instead of hot. The next day, instead of eating this as regular soup, I broke out the tortilla chips, which we used to scoop up the leftovers. Overnight, the soup became much drier than it was first day I made it, so it was totally scoopable. Delicious! If you have never tried collard greens before, or if you’re like me and think of them only boiled down to a pulp with ham hock, please please please try this recipe. Paula Deen, I curtsy to your goodness. 1 1/2 cups chopped green chilies. I happened to have fresh/frozen ones on hand that a friend of Glenn’s brought to him from New Mexico. Use ’em if you got ’em. Otherwise, canned would be fine. In a dutch oven, heat the olive oil over medium heat, add the garlic and onion. Cook for 2-3 minutes, until slightly softened. Add the chicken, cumin, oregano, white pepper, and red pepper flakes. Season with salt and 1-2 teaspoons freshly ground black pepper. Cook until the chicken is slightly browned on both sides, 3-4 minutes. Add the collard greens and cook, stirring occasionally, until they are slightly wilted, about 5 minutes. Add the chilies and chicken broth and bring to a boil, stirring occasionally. Reduce the heat to medium low, cook, stirring occasionally for approximately 1 hour. As soon as the chicken was cooked through (after about 15 minutes), I helped it along by breaking it up a little bit in the pot. After a while, it will begin to get very tender. If I had time, I probably would have let it simmer for another 1/2 hour to get it even more tender. Stir in the beans in the last 10 minutes of cooking. Garnish and serve. This has been one busy week. On top of regular work projects that needed attention and various urgent home repairs, I had to complete an 8,000 word essay for the journal Food and Foodways. I submitted a proposal last spring to write an essay on the Birmingham Public Library Archives collection of interviews of the people of Gee’s Bend, Alabama, and it was accepted. You may have heard of Gee’s Bend’s Quilts; they have become nationally and internationally famous, touring around the country and inspiring books, plays, and museum exhibitions. But my interest in Gee’s Bend has to do with food. The Archives happens to have about 30 interviews of “Gee’s Benders” from the late 70s and early 80s; and Gee’s Benders talk to their interviewer about growing up this isolated part of Alabama in the early to mid-twentieth century. Though they talk about quilts, politics, and religion, one of their favorite subjects is traditional soul food: collard greens, black eyed peas, cornbread, pork, and of course, sweet potatoes. Though I had an entire summer to write this article, I did not actually begin writing until about a month ago when my other work at the Library seemed to settle down a bit. But of course, things never settle down like you think they will, and this final week of writing was filled with early mornings, long days, and late evenings. Then, in the middle of the week, when I didn’t have a moment to think about cooking, Glenn brought home the first of this season’s sweet potatoes. I got home from work on Wednesday night, tired and cranky, and saw them sitting on the counter, just another thing needing my attention. I thought about looking up a recipe or two, wondering what fancy schmancy thing I could do with them, but I just couldn’t do it. I was exhausted. So, I did the absolutely simplest thing I could do: I washed them, poked them with a fork, and threw them in the oven to roast for about an hour while I watched House Hunters…er, I mean CSPAN. When they were tender, I split them in half, scooped out the meat, and mashed them in a bowl with butter, brown sugar and sea salt. That’s it. That was dinner. Comfort food in a bowl. The people of Gee’s Bend didn’t mess with any butter, brown sugar, and sea salt, but I think they would have approved. To make a long week’s story short, I got my essay turned in on Friday, but with a little help from some mid-week soul food that absolutely lived up to its name. Wash (scrub if you’re scareda dirt) and poke holes in sweet potatoes (to let the steam escape). Roast them in a 375 degree oven for 45 minutes to an hour. My sweet potatoes were big and took a whole hour. DO NOT TAKE THEM OUT EARLY–they will be kind of tough and stringy and just no fun. I put mine in a bowl with the rest of the ingredients and mashed them with a potato masher, but feel free to use a mixer if you don’t like yours with some lumps. Because the size of sweet potatoes varies (don’t worry, size doesn’t matter, unlike what some people tell you), test the butter/sugar/salt ratio until you find something you like. I particularly love sea salt in this recipe. The coarseness of the salt granules means they don’t quite melt all the way, and a little salty grain is nice with such a sweet vegetable. If you’ve got it, I would recommend some pork ribs or collard greens with these (Gee’s Benders knew what they were doing). Do you know what I’m waiting for? Sure, I’m waiting for the stuff everyone else is waiting for: peace in the middle east, health care reform, cars that can fly, etc… But what I really really really can’t wait for is for someone to invent the replicator. You know, from Star Trek? Oh, how many times I have wanted to walk up to my replicator window and order up a cup of earl grey tea, hot, just like Patrick Stewart, and have it instantly! And the thing I imagine about the replicator is that whatever you order would be perfect. Your filet would be exactly medium rare, just like you want it. Your hot chocolate would be not-too-hot to drink and not-too-cool you have to throw it in the microwave. Your pizza would have the exact right amount of crispiness around the edges. And your butternut squash bread? Well, the replicator would bake it *all the way* and not take it out five minutes too soon like a mere human such as myself. What has stood between me and bread perfection time and time again? Impatience…about 5 minutes worth, to be exact. I can’t tell you how many times I’ve taken bread, cake, or cookies out of the oven too early. Sometimes it works in my favor–who doesn’t love an ooey gooey chocolate chip cookie or brownie? But with things like bread, you just have to be patient. Let the peak of the bread solidify before you take it out even when you think the edges look brown and ready (Kelsey!). Other than that little problem, this bread was excellent. The cool thing about butternut squash is that it is practically indistinguishable from pumpkin, so you can substitute it for any recipe you have that calls for pumpkin. I used my mom’s extraordinarily simple and delicious pumpkin bread recipe. This recipe is really no-nonsense: just mix everything up together, pour in the bread pan, and bake. Done. You can add raisins or cranberries, walnuts or pecans, coconut or chocolate chips. Eat it with a slab o’ cream cheese if you want to. Just, please, please, whatever you do…don’t take it out of the oven too early (Kelsey!). Until my replicator is installed (you know, next to my holodeck and transporter), this will be one of my favorite recipes. 1 to 1.5 pounds cooked butternut squash-pureed or at least mushed up really well.